Our approach to this salad was to find the best recipe and stick with it. We bake our falafels in a skillet and on cooking sheets. We chose our ingredients to be parsley lettuce, cucumbers, and pickled turnip. 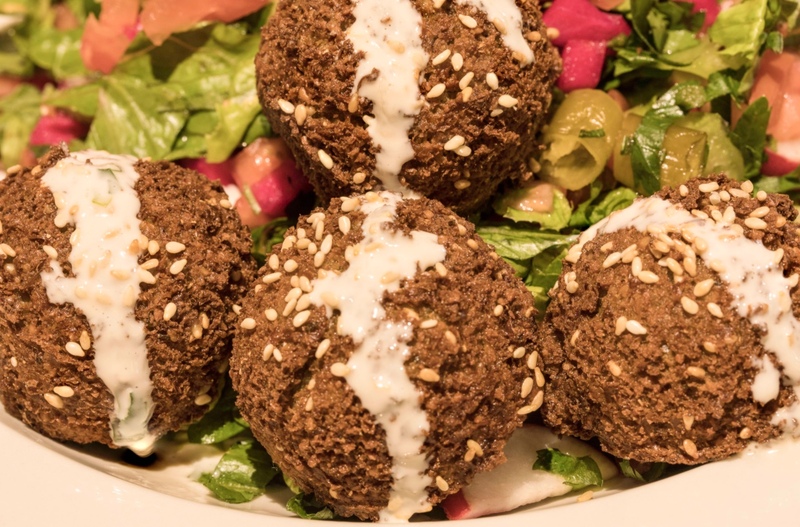 The dish comes with three falafel balls with tahini sauce spread all over. You didn’t think we forgot about the tahini sauce, did you? There is no denying that the falafel usually is wrapped in pita bread, with the toppings and sauces spilling down your hands and possibly on your pants. Even though that is an experience that cannot be replaced, we decided to try anyway. With this new salad, you can enjoy your falafel without the risk of spilling anything on your work pants that you have to wear to the office after your lunch break! We designed this dish to be in a large bowl that will satisfy your every craving! Come and enjoy this flavorful, delicious falafel salad to see for yourself! Also, check out our menu for more amazing Lebanese cuisines! Read what others had to say on yelp!